These chairs have been vetted as authentic, dating from the 19th or early 20th Century. Asipim chairs are often seen in Asante royal courts leaning against walls when not in use. Constructed simply out of wood with a hide seat they are patterned after 17th or 18th century English chairs known as "farthingale", "upholsterer's chair", or "embroiderers' chair". Through time they have become identified with Asante chieftaincy becoming symbols of social status and rank in which even minor chiefs will have a number of asipim chairs and more prominent chiefs will have many more. Reflecting Asante expectations of their rulers to be firm and authoritative, the chair takes its name, asipim "I stand firm". Asipim chairs will be decorated with brass tacks and caps, turned finials, worked brass sheets which are incised, worked in repousse' or stamped. The turned brass finials called ntuatire attached to the tops of the chairs represent abstracted claws of an eagle. These finials were made in Europe and traded in the region. 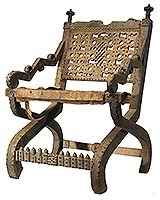 Akonkromfi chairs are the most sculpturally complex of chairs found among the Asante. The chair has legs crossed like modern folding chairs and their angle and lightness of carving gives them the appearance of a 'praying mantis' from which it takes it's name akonkromfi. Owned by chiefs they were used upon ceremonial and public occasions when they were sat upon, often with pillows cushioning the seat. 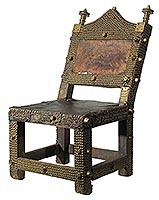 Possibly based upon early European styles of folding chairs through time they have become among the Asante highly embellished with figural elements worked into the wood along the top as openwork carving on the backrest, arms, and legs. The various iconic elements found on the chair are nearly 'baroque' in their forms and reflect attempts to identify with European sources. Often the chairs will have European style coats of arms or heraldic display on their backs. 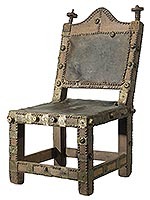 The outer frames are often decorated with round-headed upholstery brass tacks European machine turned brass finials known among the Asante as Ntuatire were attached to the tops of the chairs represented the abstracted claws of the eagle.